Why I Chose This: Shortly after my loss 7 years ago, I was a wreck. My husband (then fiancée) had to be out of the state for months due to work. I had my family and friends but I still felt so alone. My mom had lived through so many miscarriages, but even she didn't know how to help me. The pain was so deep and I felt like I had nowhere to turn. Then one day, this book arrived in the mail, along with a figurine similar to the one on the cover. It was accompanied by a note from my fiancée, which said: "I know it hurts now. I wish I could be there. I love you and I know how strong you are but it's ok to cry. And you need to know this isn't your fault. There's nothing you could have done differently." 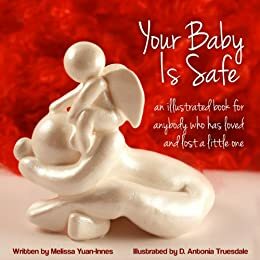 This book is perfect for anyone going through a loss of an unborn child or a baby. There are never the right words, but this book has helped me every year to deal with my loss, and for that, I couldn't be more grateful.